This all-season space might be small on size, but is truly grand on style, utility and ingenuity. 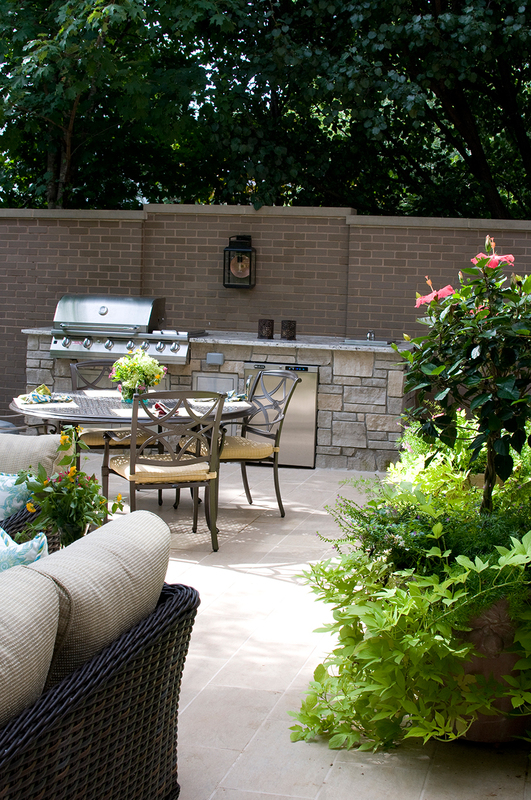 The challenge for this Clayton back yard was to create an outdoor living space within a very constrained footprint. The final product is a masterpiece. A pool, Jacuzzi, deck, grill, fire pit and lush landscaping combine gracefully on the plot with, what feels like, plenty of room to spare, thanks to Baker Pool design team. The space is a natural extension of the house, providing an indoor/outdoor area for entertaining year-round that seamlessly extends the home’s contemporary interior design to the outdoors (and vice versa). French doors open wide directly onto the deck from the kitchen, inviting easy flow between the two spaces. Even when the doors are closed, the glass panes offer a view directly to the pool, centered on the fountain. Landscape designer Scott Gamelin with Flora Design and Landscape fittingly describes the back yard as “a large shade garden with a pool in the middle.” When the homeowners purchased the home in 2012, they wanted to preserve as many trees on the property as possible, including a flowering cherry and a flowering pear tree around which the deck was built. 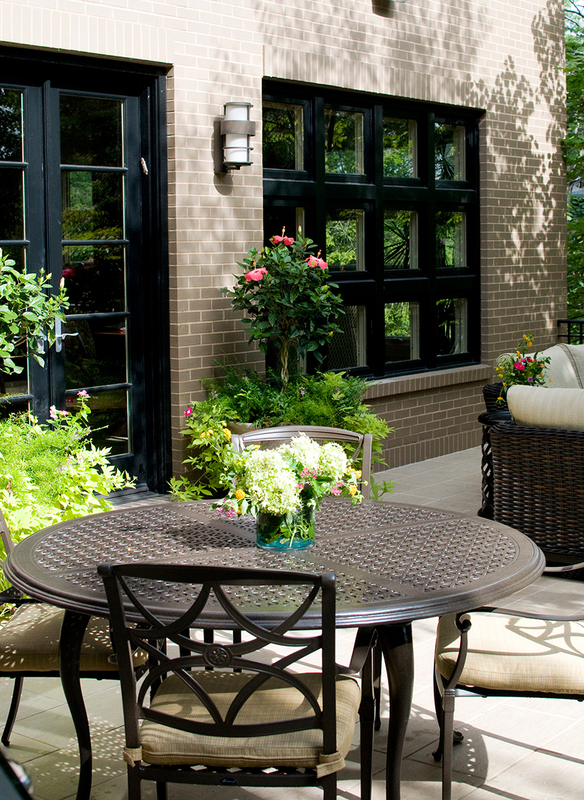 The rest of the landscaping features low-maintenance flowering shade plants, such as hydrangeas, hostas, azaleas, iris and creeping Jenny and was designed to provide privacy, seasonal color and a connection to nature in an urban environment. All of this beautifully set the stage for the primary feature of the backyard – a limestone-rimmed saltwater pool with cascading waterfall and large “floating steps.” The waterfall adds height and dimension while also masking noise from the nearby streets of downtown Clayton. 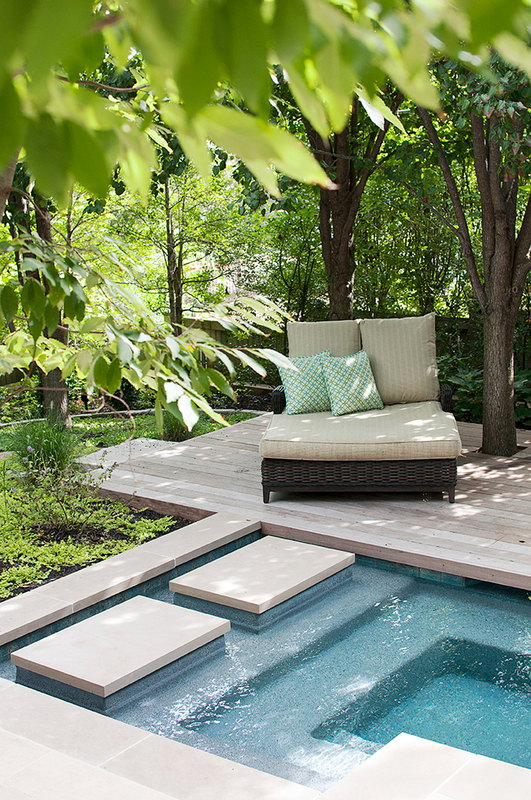 The steps add yet another layer of design intrigue, while also providing a pathway to the back lounging deck. It’s a perfect example of “form following function,” explains Baker Pool Construction Director Robert Warren. 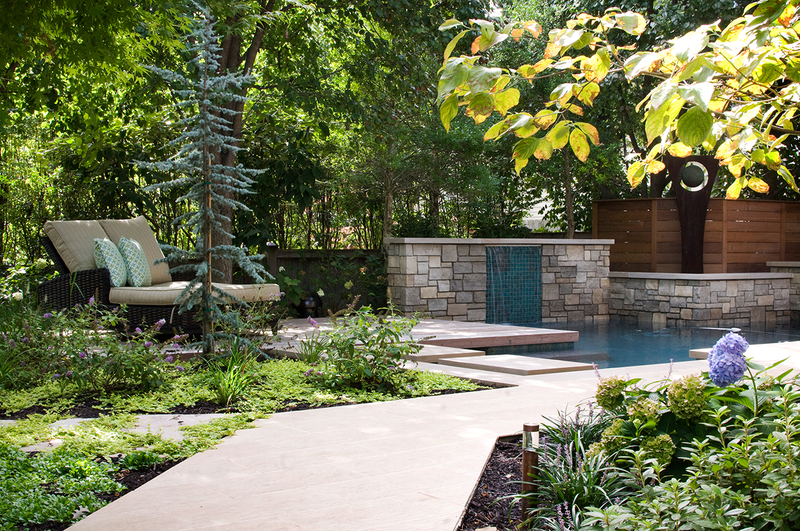 Building the walkway into the pool in lieu of a sidewalk along the side introduced a dramatic design element and allowed the small pool to be extended by an additional five feet. The now 16’ x 28’ pool maxes out at a depth of six feet with a steep slope to the deep end creating an ideal depth for water aerobics. The pool is heated to allow usage from April through October. The deck surface layered with tile is just as impressive. On one side is a world-class outdoor kitchen, and on the other, a rectangular fire pit with seating for 10. The kitchen area features a stainless steel grill, refrigerator, counter-mounted beverage cooler and matching stainless steel drawers for storage. The space is framed by a tall brick wall that defines the space while also providing privacy from the neighboring property just on the other side. The gas fire pit, a cozy gathering space on chilly nights, is constructed of limestone and filled with colored glass. The deck is continued on the far side of the pool with a lounging area that extends out over the water (and also hides the pool’s filters). When the pool is drained and covered for the winter, the hot tub, located just below the deck, becomes a cold-weather retreat. Though integrated into the backyard design with matching ipe Brazilian hardwood facing, the plumbing and heating system is separate from the pool so that it can be used year-round. The entire space is transformed at night – copper pendant down lighting installed in the trees and copper perimeter balusters provide striking architectural lighting to the pool, waterfall, large trees and garden sculpture. Eight hidden speakers and a subwoofer provide directional sound throughout the area. All of the lighting, speakers, waterfall and pool heater are controlled by a phone app. This all-season space might be small on size, but is truly grand on style, utility and ingenuity.